If you've upgraded your trucks front end to late model 5-lug on 5" Chevrolet truck bolt circle disc brakes, now is the time to upgrade your rear end. With the availability of 5-lug trailing arm rear ends quickly drying up, we now offer 5-lug axles that will install into your 6-lug rear end. Our axles come pre-drilled with a 5-lug on 5" Chevrolet truck bolt circle and fit 1963-70 rear ends. The axles accept 1971-72 truck drums and use the existing brake hardware. 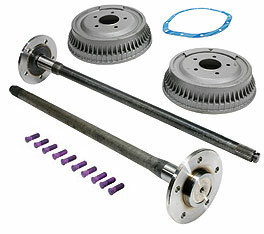 Available as a complete kit with axles, wheel studs and new brake drums or the pieces may be bought separately. 1963-64 trucks require the use of the spider gear set. Will not work with 1960-62 trucks. Note: Factory 6-lug applications had 7/16" dia. studs and 5 on 5-lug kits have 1/2" dia. studs.